Thug. Dirty Player. Walking red card. That is the word on the street. And having watched the Netherlands play in the World Cup Final last year where van Bommel was amongst those to receive one of the plethora of yellow cards shown that day, I quickly fell for the labels. Why was AC Milan signing this guy? We don’t need red cards, we need trophies! In January of this year, just before the transfer window closed, AC Milan signed Mark Peter Gertruda Andreas van Bommel to a six month contract. The 33 year-old had reportedly not been very happy at Bayern Munich and was willing to take the short-term contract with Milan. Why? I have a theory, but first you need some background. Mark van Bommel began playing at RKW Maasbracht as an amateur. His first professional team was Fortuna Sittard in Holland, where he played beginning in 1992 and won the league, Eerste Divisie, in the 1994-95 season. From there it was on to PSV Eindhomven in 1999, where he won Eridvisie titles in ’99-’00, ’00-’01, ’02-’03 and ’04-’05. They also won the Dutch Cup, or KNVB Cup, in ’04-’05 as well as the Johan Cruijff Shield in ’00, ’01, & ’03. Additionally, as an individual, he was honored with the Dutch Player of the Year Award in 2001 and 2005. From PSV, a fellow Dutchman, Frank Rijkaard, who just happened to be managing Barcelona at the time, lured van Bommel to play for the Spanish side in 2005. It was probably not very hard, as Barcelona is reportedly the team that van Bommel supported as a child. He even spent the summer taking Spanish lessons at a Convent to prepare for his next team. Which definitely paid off, because with Barcelona that year, he was part of the Champions League winning team that also won La Liga and the Supercopa de España. However, the next season saw him in the Bundesliga, playing for Bayern Munich, where he played for the next 4 ½ years. During those years, Bayern Munich won the Bundesliga title in ’07-’08 and ’09-’10. They also won the preason DFB Ligapokal tournament in 2007, as well as the DFB-Pokal (similar to Coppa Italia) in ’07-’08 and ’09-’10. He was such an integral part of their team that when the legendary Oliver Kahn retired in 2008, van Bommel became the first non-German captain of Bayern. Okay, so before I go on, why did Milan want him so badly? And why was he willing to come to Milan? It’s all about winning titles. Milan wanted to win Serie A, and they looked around and saw a player who has won titles in 3 different leagues. He knows how to win. Mark van Bommel saw a team with a potential to win a title this year, so a six month contract with the prospect of another title in yet another league had to be appealing. Winning titles: that’s my theory as to why, and I’m sticking to it. Of course, it isn’t always going to be about winning. Representing your country is an honor in and of itself. 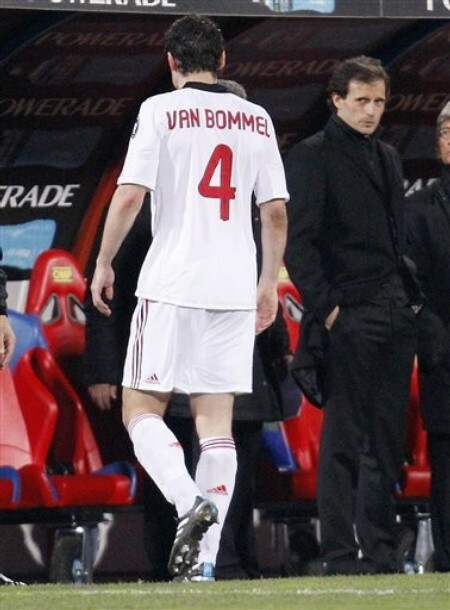 An honor van Bommel first had in 2000. Holland did not qualify for the 2002 World Cup, and he was injured during Euros ’04, so 2006 World Cup qualifying was his first real chance to shine in a major tournament for his country. Except that a certain Marco van Basten was coaching the Oranje at the time, and after one poor performance by van Bommel, he left him off of the squad. When van Bommel was finally called up again, he is quoted as saying he “would not play while van Basten was in charge.” Well, eventually the coaching position was filled by van Bommel’s father-in-law, the current Netherlands coach, Bert van Marwijk. So when his callup came under this coach for the 2006 World Cup, van Bommel acquiesced. He has represented the Netherlands since then, including at last year’s World Cup, which saw the Oranje finish as runners up. 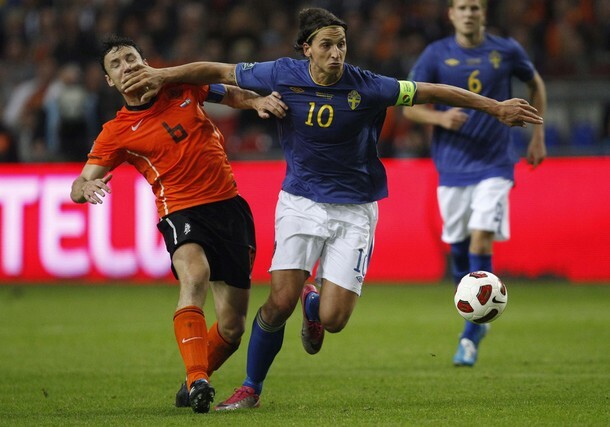 He has also since been handed the captain’s armband for Holland. But what about his notorious temper and penchant for playing tough and tackling hard? Well, a couple of incidents come to mind. First, in the 2006 World Cup tournament, you may remember what is now referred to as “The Battle of Nuremburg.” It was the Netherlands vs. Portugal, and there were a record 27 cards handed out in that one match, van Bommel’s being the first. He received his booking in last year’s World Cup Final in the 22nd minute, too. He has even had high profile spats with current teammates Ibrahimovic and Robinho while they represented their individual National Teams last year. Yes, van Bommel tackles. Yes, he plays hard. Yes, he has been known to spout off or offer obscene gestures to the referees. But what of the red cards? That part is mostly myth. He has averaged less than one red card per year in all competitions - league, European, and National Team combined. He seems to prefer the yellow cards, with an average of 9 per year in all competitions. Which is probably not the worst record ever, considering that he’s started an average of 36 games per year. For a defensive midfielder whose job it is to take the ball from the other teams, it’s to be expected to be booked here and there. Never send a gentleman to do a brute’s job. He got his token red card of the season out of the way this season in his first Serie A start against Catania, picking up a second yellow that most describe as “soft.” (Consider it his welcome to Serie A from the referees.) But by that time, he had also played in the Coppa Italia match for Milan vs. Sampdoria the day after stepping off the plane. So I had already seen that there was much more to this perceived ogre than just a collection of cautions. You see, van Bommel plays best at the central midfielder position, although he can also be used as a playmaker. He’s got a very powerful shot, solid ball-handling skills, and despite the cautions, the ability to make beautiful tackles. Despite being “old” at 33, he’s still got more pace than some of the younger defensive midfielders. But what surprised me was his passing abilities. Rarely do you see someone with so much “brute” ability who is able to make such precise and beautiful passes, whether short or long, he seems to be able to get the ball where it needs to be with great skill. He is so absolutely a high quality player, even if he comes with a bit of tarnish that is not always warranted. And so, while the hero quietly hides behind the mask of the “thug” or “dirty player” or “walking red card,” van Bommel is a true champion. He knows how to win titles, and is a leader on the field. But he is also someone whose reputation sadly trumps his amazing talents as a player. So in a way, he’s like a secret weapon. While the other teams focus on trying to stir him up or get him carded, he will quietly and masterfully do what he does best: take the ball from them, and deliver it right to where its needed. Oh yeah, and win titles. And that is why I’m glad to have him on my team. Feel free to extend your contract, Mr. van Bommel. Ti voglio bene!